A Nord Fork (sometimes spelled "nordfork") is a device that fits behind the head of a calf to help hold it while the ground crew works (vaccinates, castrates, brands, etc.) the calf. 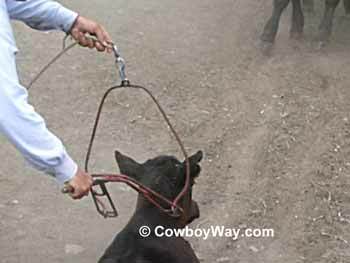 To use a Nord Fork a mounted rider ropes a calf by the heels then drags the calf past the ground crew. As the calf goes by, one of the ground crew members slips the Nord Fork behind the calf's head. 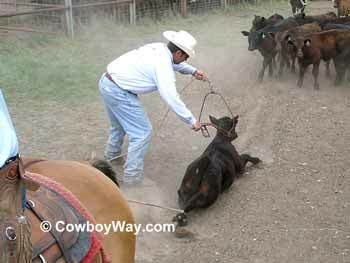 As the heeler continues to drag the calf a rope and inner tube tied to the Nord Fork and staked into the ground tighten. When the rope and inner tube are tight, the heeler quits dragging. 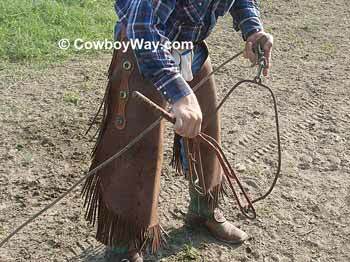 The heeler continues to hold the heel rope as the calf is worked, and the Nord Fork holds the front end. Below: A Nord Fork. The part of the Nord Fork in the man's right hand goes behind the calf's head. The part in the man's left hand goes in front of the calf's head. When the ground crew has finished working the calf the Nord Fork is easily slipped off, then the heeler releases the heels to free the calf. Using a Nord Fork eliminates the need to rope the calf's head or to put a rope on its front legs. 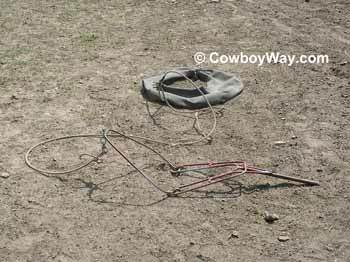 Below is a Nord Fork tied to about 8 feet of rope that is then tied to an inner tube that is staked into the ground. The man on the left side of the photo is holding a Nord Fork and waiting for the heeler on the bay horse to bring the calf by him. Putting the Nord Fork behind the calf's head as it goes by. This is a close-up of the photo immediately above, showing the Nord Fork going behind the calf's head. The Nord Fork was invented by Nord Hill of Taber, Idaho. A cattle rancher for more than 29 years, Mr. Hill got the idea for the fork in 1991 while watching his son rope calves. As he watched the calves pass by with their heads in the air he came up with the idea of the Nord Fork to shorten the time each calf is worked and to make handling easier on the calves.